Speaker of the House Nancy Pelosi (D., Calif.) and Democratic leaders in the House of Representatives released a statement Monday calling Rep. Ilhan Omar's (D., Minn.) use of anti-Semitic tropes "deeply offensive." "Congresswoman Omar's use of anti-Semitic tropes and prejudicial accusations about Israel's supporters is deeply offensive," the statement reads. "We condemn these remarks and we call upon Congresswoman Omar to immediately apologize for these hurtful comments." On Sunday night, Omar linked to a tweet by Intercept journalist Glenn Greenwald, which criticized Republicans for calling out Omar and her fellow freshman Rep. Rashida Tlaib (D., Mich.) for being anti-Israel. Omar wrote, "It's all about the Benjamins baby." Forward opinion editor Batya Ungar-Sargon responded to call out Omar for using an "anti-Semitic trope" and asked her who is "paying American politicians to be pro-Israel." "AIPAC!" Omar responded, referring to the lobbying group American Israel Public Affairs Committee. AIPAC does not give money to candidates. The House Democratic leadership consists of Majority Leader Steny Hoyer (Md. ), Majority Whip James Clyburn (S.C.), Rep. Ben Ray Lujan (Calif.), Rep. Hakeem Jeffries (N.Y.), and Rep. Katherine Clark (Mass.). They all issued the joint statement together. "Anti-Semitism must be called out, confronted and condemned whenever it is encountered, without exception," the statement reads. "We are and will always be strong supporters of Israel in Congress because we understand that our support is based on shared values and strategic interests." The statement comes after numerous Democratic lawmakers released their own statements criticizing Omar. The first was Rep. Max Rose (D., N.Y.), who is Jewish himself, calling her words "hateful and offensive." Pelosi confirmed she spoke with Omar and said the two will use the moment to tackle anti-Semitism. 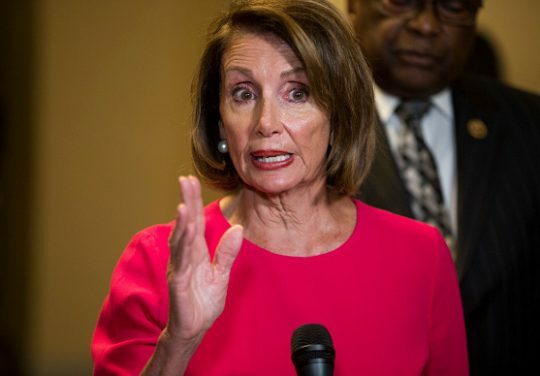 "In our conversation today, Congresswoman Omar and I agreed that we must use this moment to move forward as we reject anti-Semitism in all forms," Pelosi wrote in a tweet. Omar was recently asked about her past controversial remarks regarding Israel and how she has learned about anti-Semitism. In her response, Omar failed to mention Jews or anti-Semitism. This entry was posted in Politics and tagged Anti-Semitism, House Democrats, Ilhan Omar, Nancy Pelosi. Bookmark the permalink.